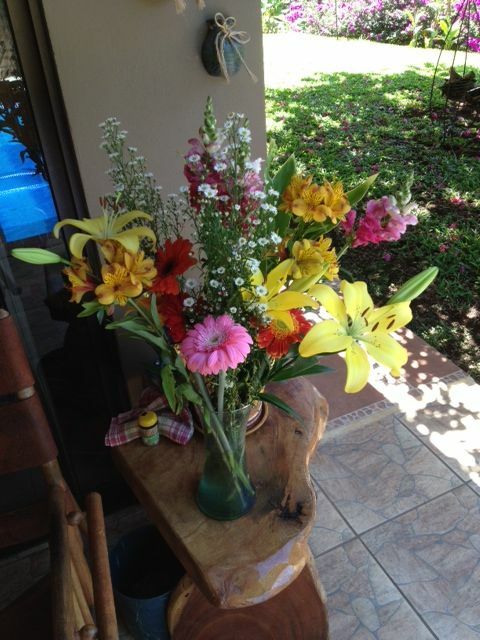 We have the best friends in Costa Rica!!! Antano’s, Yaddixa and Sandra, invited us to have an anniversary dinner there. As usual, we were not disappointed. A beautiful arrangement of flowers on the table. And a delicious dinner – with special friends, what could be better! Sandra wasn’t there because she was “under the weather”; she’s better now! We met Sandra and Yaddixa the first time we came to Costa Rica. We were staying at Frances’ and Bruce’s Lighthouse Animal Rescue in 2011. They took us to Antano’s to eat, and the friendship blossomed from there. However, when we moved here, I was beside myself, beause Antano’s wasn’t where it was 6 mos. earlier….panic set it; but I found where they moved!!! 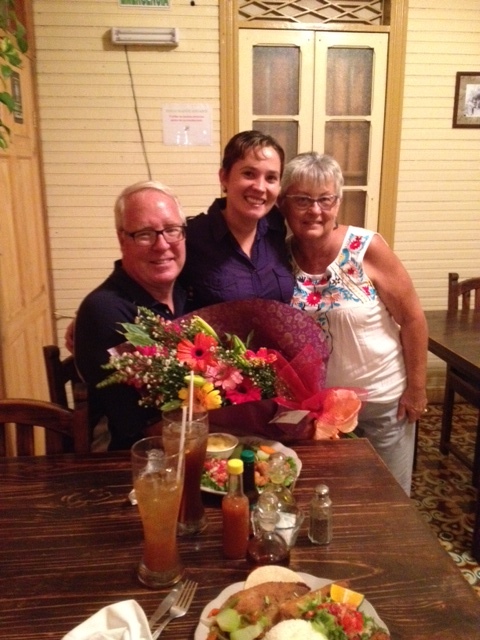 Whenever we’ve had guests come, we always take them to Antano’s…..because you know your food is good! A big thank you to the Yaddixa and Sandra and the staff at Antano’s for making our 47th anniversary special!!! OMG! 47 years is a life time!!! Hmmmm…..am I considered a FreakFlops mule? 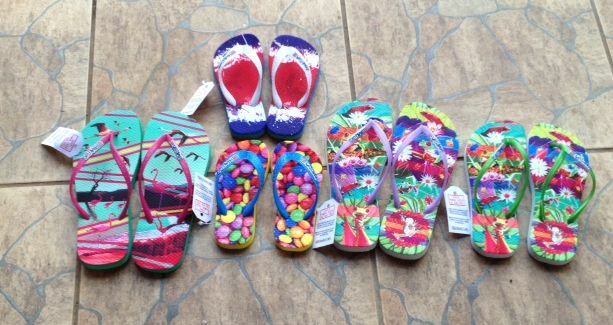 I am headed to KY on Sept. 1…..along with these FreakFlops for a friend. I think I might be a FreakFlop mule. (That’s what we call having friends bring us things from the states. Only I’m taking Costa Rican things to the US. These are so neat…..if they get dirty, just use a scrub brush to clean them up. They come in so many different designs. I am their favorite customer!!! So, anyone in Bowling Green, KY, check out their Facebook page and if you want me to bring you some, just let me know which ones and what size!!! Pura Vida…..see you soon KY.
Pizza with potato wedges topping, yummy! Denise and I decided to go shopping today instead of knitting, since everyone else was not going to be there. What!? You say, yep, we got dissed at knitting. I desperately needed some new earrings! The weather down here has played havoc with my earrings that are silver. Talk about being bummed….the silver store that I like because it didn’t seem too expensive was all closed up! BUMMER for me! Then we headed on down the mall. Looked at some bedspreads that were on sale; however, as usual, no color that would work….you know the color of dog prints! By then it was close to noon and we know what that means…..food! We tried a new place for both of us called La Fabbrica Pizza. Found a table near the in/out door to the mall and the breeze was wonderful. The waiter informed us they wouldn’t be open for 20 more minutes, but we didn’t care. 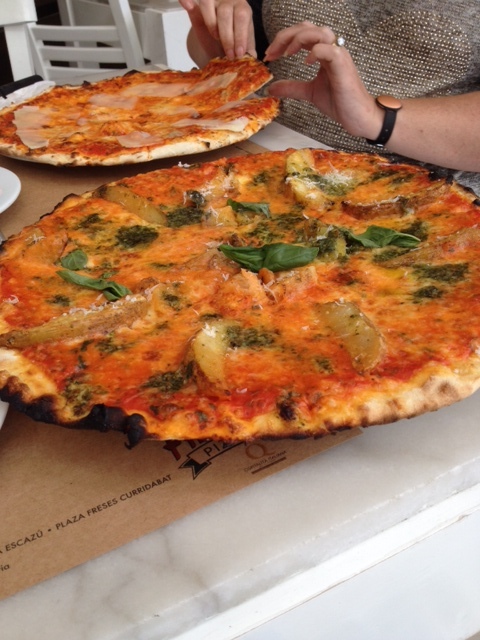 Some really different pizza toppings on this menu…..so I decided to try the pizza with papas. They had a video playing of things they make there. I glanced at it and thought I saw mashed potatoes on top of a pizza! However, after watching it longer, I realized that it was just pizza crust and they were pouring water on the mound. I thought it was mashed potatoes with gravy! I had the choice of red or white sauce……now I’m thinking I should have gotten the white sauce because then it would at least look like gravy! When the pizza came, it was actually potato wedges on top! It was very good and different tasting….with basil. Very yummy…Denise had a 4 cheese pizza and focaccia bread topped with cheese. I’m sure she won’t poop for a week! Then one of us (not me) needed some Mrs. Field’s cookies so headed there. By then it was my nap time and we headed home. Was a nice day to go “wander the mall”. I’ve taken the leap!!! Been using CAJA for dental work. CAJA is the government health insurance you have to be a part of when living in Costa Rica. When you’re “elderly” it’s a plus in this country…..on the first Monday of the month, only seniors can stand in line to get an appointment. Last month, one of my friends’ “workers” went with me to show me what to do. It’s not rocket science! Show your carnet (didn’t even ask for proof of payment for CAJA, or to see my cedula. My first appointment was 2 weeks after making it. I need a follow up appointment and today was “senior appointment” day! When I drove up, the line in front of CAJA was really long, really, really long. The gate to the parking lot wasn’t even open. I thought by getting there at 6:30 a.m., I would be in the front part – wrong. So I parked the car on the street beside CAJA and realized there was another line…..and it looked to be full of elderly people. Dylana, Nazareth, and Gabriel rode in with me to go school; picked up another guy on the road. As we got out of the car I asked Dylana if that was the line for old people! She looked at me and gave me a big grin and nodded yes. Finally, at 7, the gates opened. The majority of people in line in front of CAJA were there to make Dr. appointments, I needed a dental appointment. I was probably 12-15th in line……no biggie…..an appointment next Tuesday morning! And I was home by 7:30 a.m.
And I did it all by myself!!! !